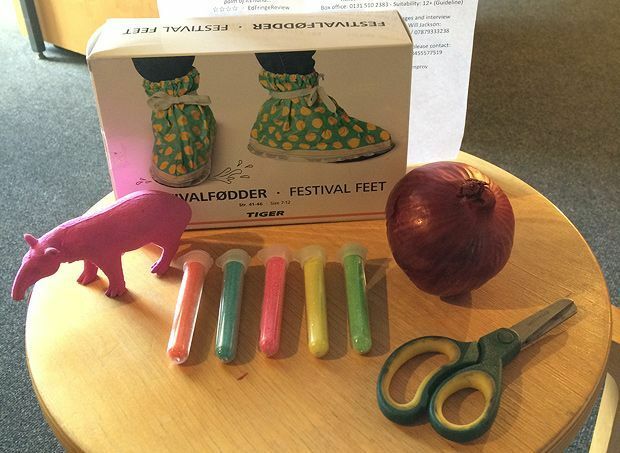 When Watch This Improv told us they were sending us the Ultimate Edinburgh Fringe Survival Kit, one thought raced through our minds: god, there'd better be a giant pink rubber tapir included. Luckily, this comedy troupe has its head in the game. There, nestled in the bottom of the package was a massive pencil eraser shaped like the large, herbivorous mammal. Prehensile snout and all. It's there to help us erase our Festival mistakes apparently, which is kind of ironic, because our biggest mistake was not owning a tapir eraser in the first place. Other items in the kit included several tubes of glitter (which certain staff members are already planning to adorn their faces with at the Festival Party), something called 'festival feet', which is essentially a shower cap for your shoes, and an onion to keep our fruit and vegetable intake up, lest we get scurvy or something. Thanks to this kit, we might actually survive long enough to see their Fringe show Improvabunga!, which is on at theSpace on Niddry Street. The show is based on audience suggestions, so that is literally all the info we can give you. Oh, except that it's on at 8.05pm. Presumably, the five minutes after 8pm are for pre-show onion eating and intense glitter application. It's important to eat a balanced diet, and though we were happy with the onion, we were also pleased that Gary From Leeds sent us a single garibaldi wrapped in clingfilm. It accompanied a bald cap, described by G Unit as 'a baldness empathy device'. Together, they illustrate to us the nature of his show, Garibaldi, which is a 'lanky northerner and his bereft bonce for an anarchic hour treading the fine lines between miserable and uplifting, poetry and karaoke'. If you're a performer, and you've been inspired to send us something in return for a chance at coverage, please do. No sexual favours or cold hard cash, nothing dangerous, and nothing illegal or gross.